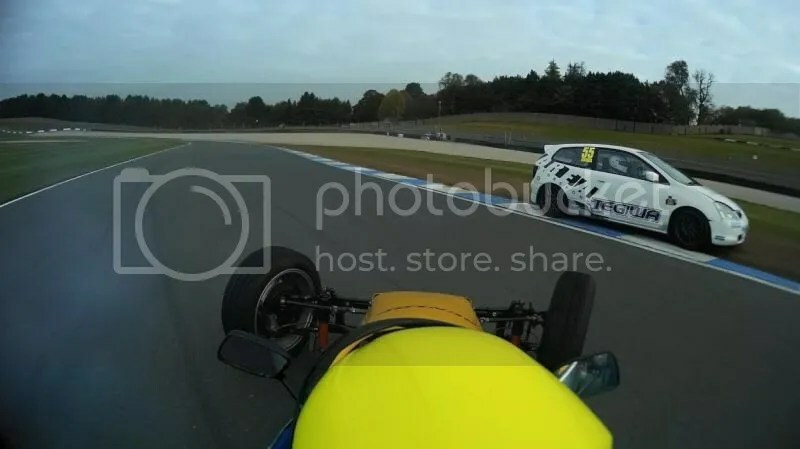 After the damage sustained from the crash and the engine failure at Donington Park last month, we needed to get through the weekend at Brands Hatch with the car in one piece. 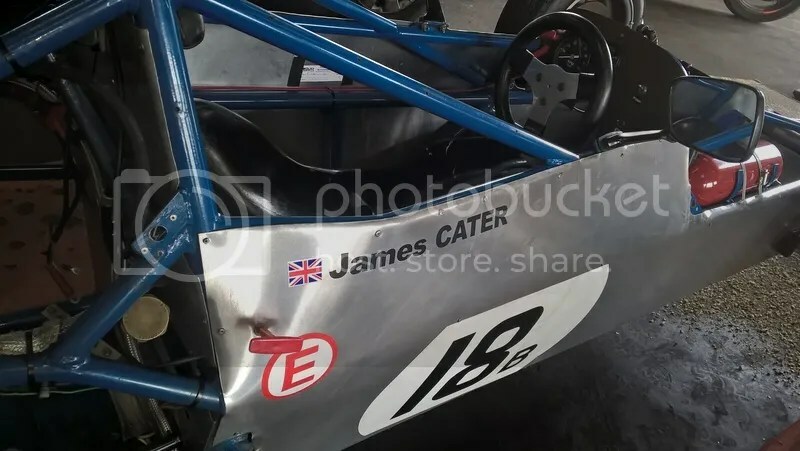 Glenn Hay had straightened out the front beam and worked hard on the front suspension, but as I drove out of the tunnel underneath the circuit for the qualifying session, we had a problem. I dabbed the brakes but the car veered hard right. Weighing up our options before we went out on track, I decided I’d see if we could crawl around the minimum 3 laps, and then we could do something before the first race. Luckily, after the first lap the car was straight and true! I suspect it was either the camber of the tarmac that had dragged me right, or maybe a piston stuck in the brake calliper. After a few laps I saw spots of rain on my visor, but figured I’d press on faster and faster until the car started sliding. It didn’t, but a few other cars went off. I managed a rather disappointing 21st place out of 30 cars. Not terrible, but about 6 places away from what I was expecting. 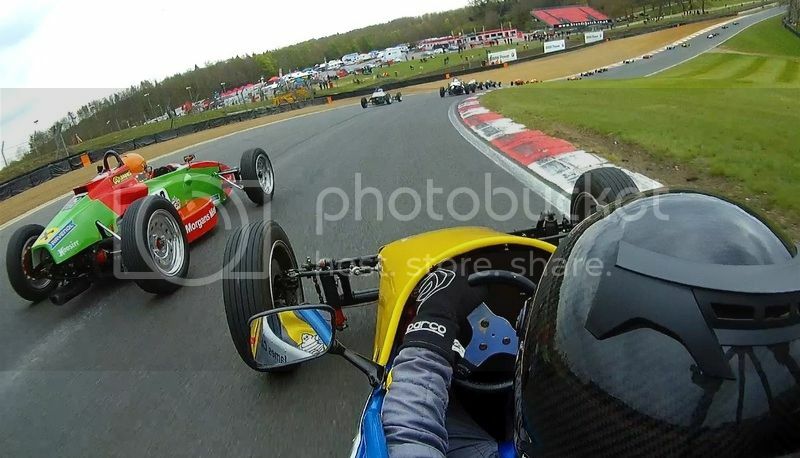 Sat on the awkward rolling hills that is Brands Hatch pit straight, I was holding the brake and blipping the throttle with my heel (the Sheane won’t idle at all if the revs drop! ), but as the lights went out I caught my sole on the edge of the pedal, so got a terrible start. Martin Snarey stole all my fortune, and shot off in the best start I’d ever seen, straight up the middle of many rows, proper taking the Mickey! I headed a bit too tentatively into Paddock Hill behind Jake Hockley, who’d finally managed to get off the line and take his driveshaft with him. 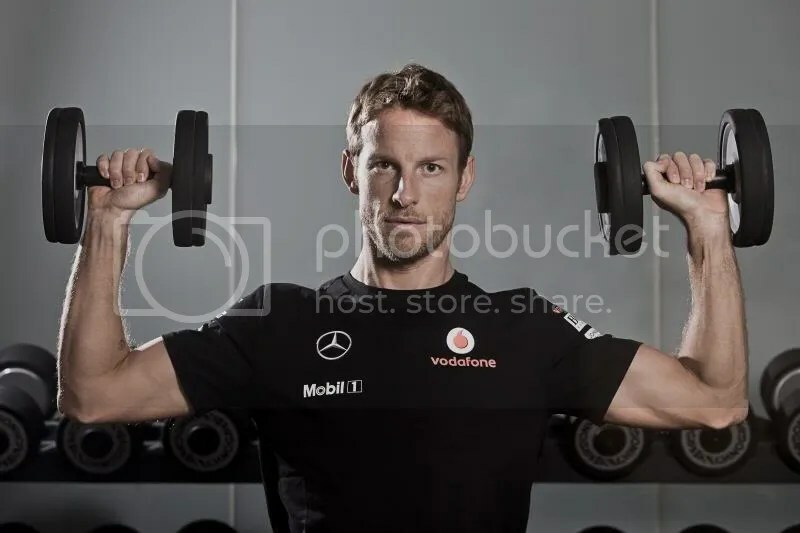 I hung onto him for a few corners before he started pulling away – great to see them finally sort their issues, and hopefully I’ll be able to drag myself up for a scrap with him once we get the car back on form! I then got a lot of pressure from the gaggle behind me – Neil Aldridge and David Leniewski in their blue AHS cars and also Sam Engineer in his brand spanking new orange GAC. Sam has now left our little group of Sheane’s, but I was pleased he’d found a second a lap straight away in his new car, and is looking good already. 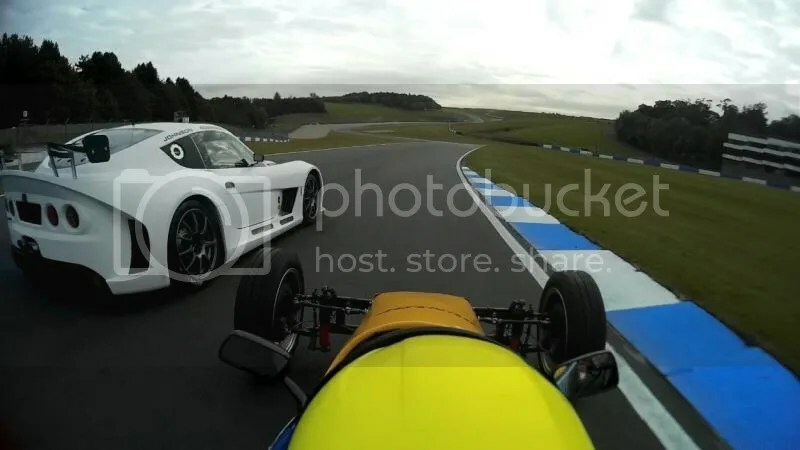 Jamie Harrison spun out of Surtees, and I had to lift off mid-corner both for the yellow flags and so I could tighten my line and get around him, but Neil unfortunately was right on the back of me and had nowhere to go other than off and into the tyres. I then had a bit of a dice with Sam, before some of the lead cars laped us and we had to back off a bit to let them through. Suddenly Sam came passed me and pulled out a huge gap straight away! I was pretty sure my engine hadn’t gone again, so I got my head down and gave chase in disbelief at how he’d found another 30hp! 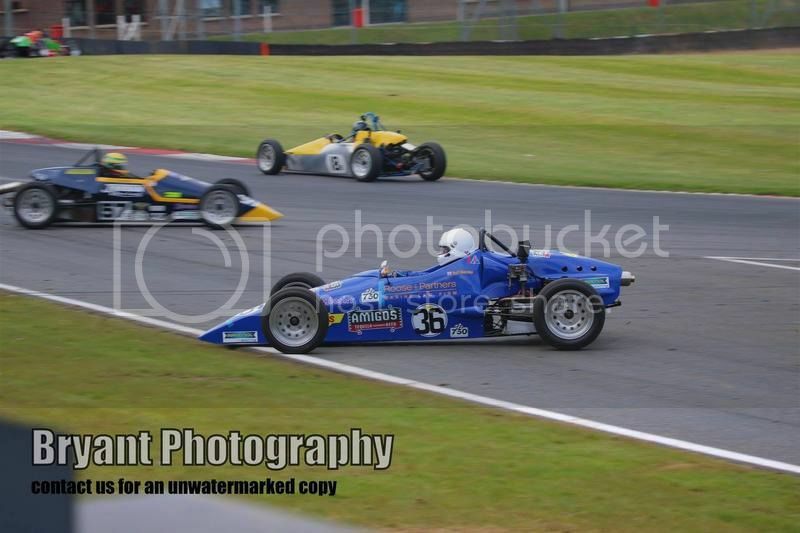 I tried my best to hang onto him, and then the back stepped out big-time through Surtees. I was facing tyres walls at very high speed, still on opposite lock, and needed to be turning right. 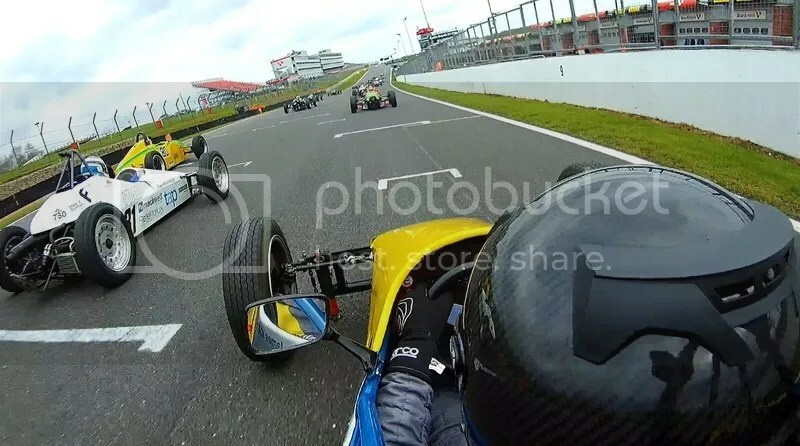 I have no idea how, but I must have snapped on the perfect amount of steering lock to catch the car, and much to my thrill and amazement still managed to make the next corner! This was a HUGE moment, but to look at the video you’d barely even notice it! One thing to stand testament to this was that my FitBit recorded a heart beat of 171bpm at this moment. I will do another blog about the whole FitBit experience in another blog soon! It’s pretty interesting stuff. I finished 18th overall, and 5th in Class B. When we were in parc ferme, I also realised the orange car I’d been chasing was actually Maurice Gloster lapping me – and Sam was still behind me in his identical car and helmet! The two laps following Maurice were also by far my fastest up until then! I got a better start, but again Martin Snarey came rocketing about 4 rows forwards. I’m convinced he’s using some kind of catapult, and will be watching him VERY carefully from now on. I out-dragged Francis Twyman and dropped down Paddock hill behind Jake Hockley once again, and just as before he steadily left me from that point on! We sat on the grid for about 15 minutes waiting for the restart. The problem here is we’re in air-cooled cars, and if you switch off your engine it might not restart again. So I sat there, on another awkward bit of track, holding the brake whilst constantly blipping the throttle to keep it from stalling. At one point I actually grabbed my right knee with both hands and physically pushed and pulled my leg up and down, as I couldn’t do it any longer! Finally, despite a leg now made purely from rubber and pain, I got another good restart, passing Francis and almost Jake into Paddock Hill. I was determined to keep up with the pack ahead, so tried my best to avoid the marauding group snapping at my exhaust, and got all kinds of out-of-shape into Paddock. I saw yellow flash in my mirrors as Francis followed me deep into the corner but couldn’t quite keep it on the black stuff. This all seemed to put the rest of my chasers off just long enough for me to draw out some breathing space, and I focused on the white Sheane of Martin Snarey in the distance, and tried to compensate for lack of power by pushing hard in the twisty bits. I steadily reigned him in, taking huge chunks out of his lead through Paddock and Druids, only to have him pull it all back in the next corners to leave the gap over the start line the same. 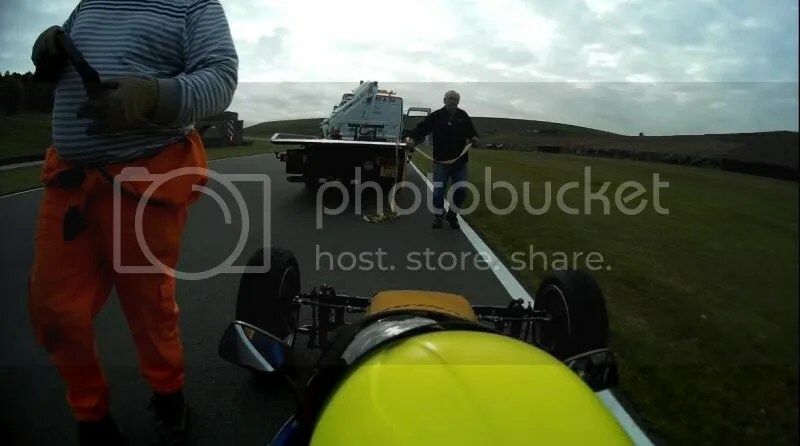 I ignored the pain screaming in my arms (did I say Formula Vee wasn’t all that physical in an earlier blog?) 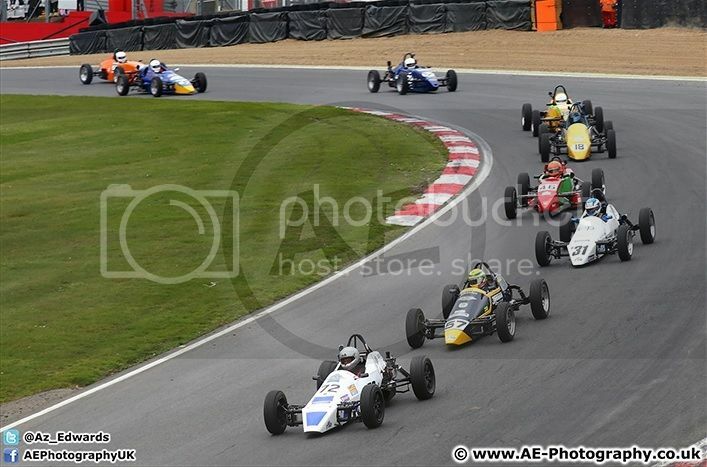 and closed right in, but had left it too late as the chequered flag came out when I was half a second behind. One more lap and I’d have undoubtedly been all over him – but passing might have been another matter! This left me 5th in class again, and 17th overall. Perhaps more of a victory in this one was that I didn’t get lapped! I don’t like getting lapped! Those are the cold, hard facts – I’ll give my take on my own performance in an analysis blog. I would like to thank Vard again for coming along to help out – and congratulations to Paul Smith who won both races, as well as Ben Miloudi and Martin Farmer who got 2nd and 3rd in race 1, and Ian Jordan and Ian Buxton for race 2. And another very special thank you to Dan at JooVoo for the amazing new JooVuu X camera that I used to capture all the action. 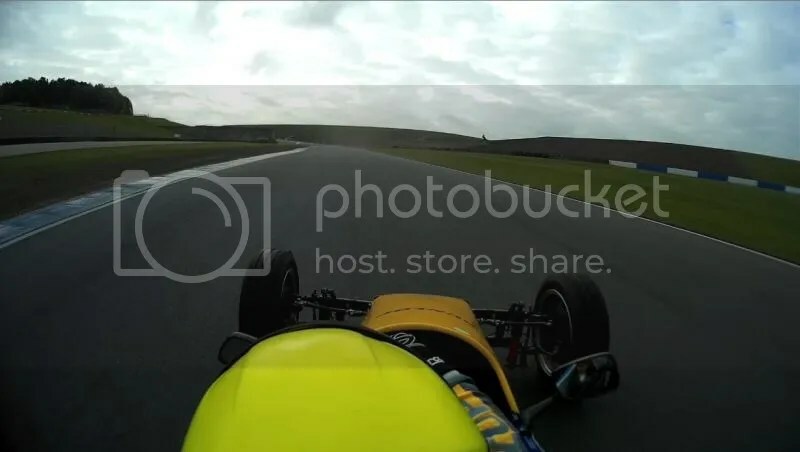 I’m sure you’ll agree that the quality of the footage is amazing, and it will get even better as we learn how to set the camera up for race use. 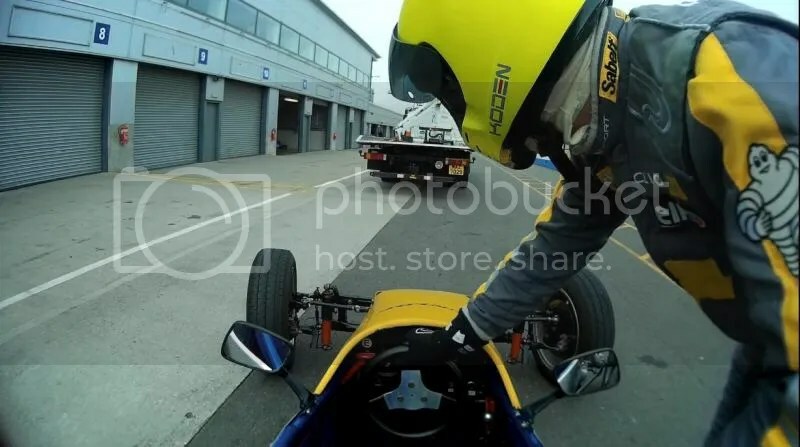 The 2016 Ravenol Formula Vee Season is about to start! 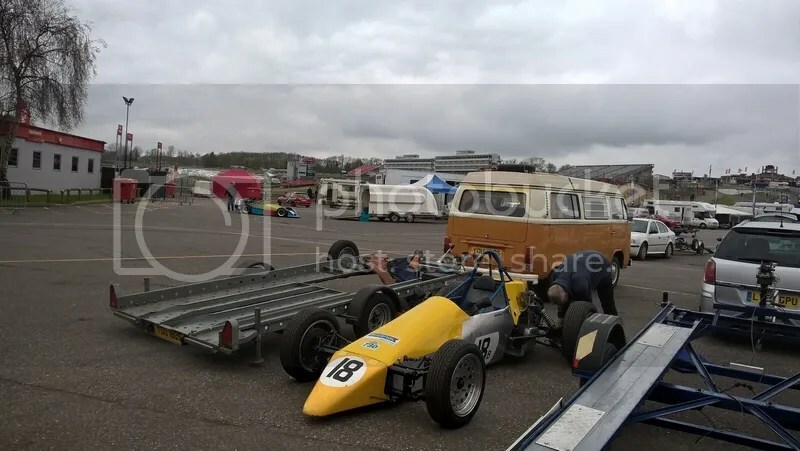 Even though the Winter ‘off season’ has lasted forever, it’s also suddenly gone, and on Saturday 20th March we’re back at Donington Park to race again! 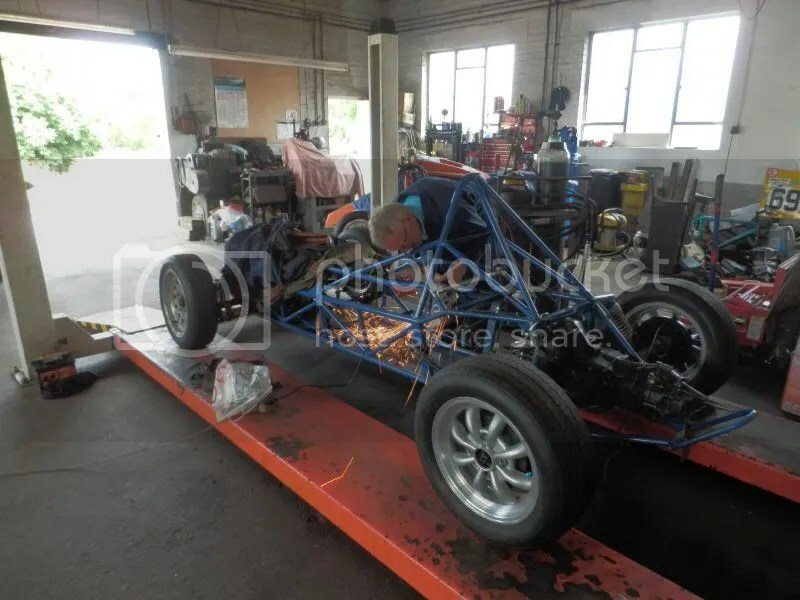 In true tradition, we’re far from ready for it, but hope to be able to get the car back together in time. 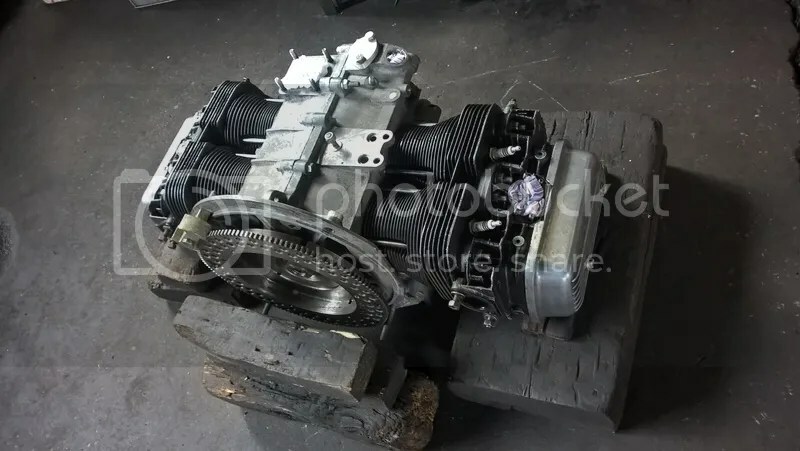 Glenn should be getting the engine in today, and then we can look forward to a few late nights as we put the rest back together. 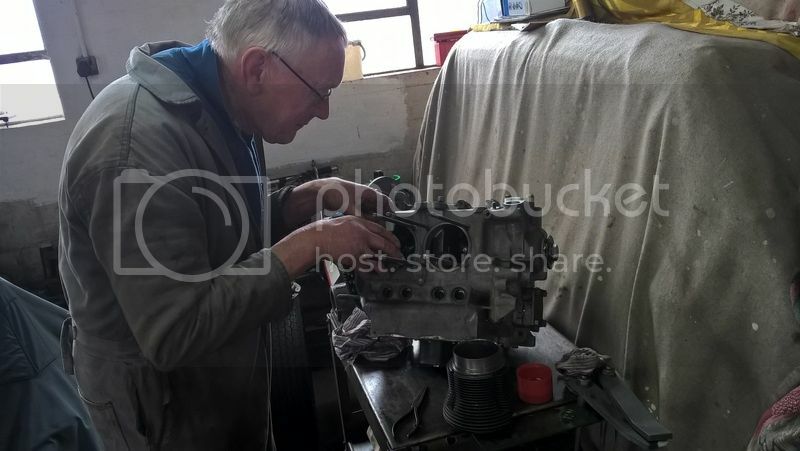 We’ve remounted the engine, lowering the rear a little. We haven’t remounted the front shocks, yet, so that will be the same as last year for a while. The bare aluminium sides are still there for now, but will also be getting painted yellow when we get chance. We’re also hoping to have a very kindly helping hand from Chris ‘Vard’ Vardon in the paddock when he can, with another few offers to help out, from others. That should make our life a lot easier between races! 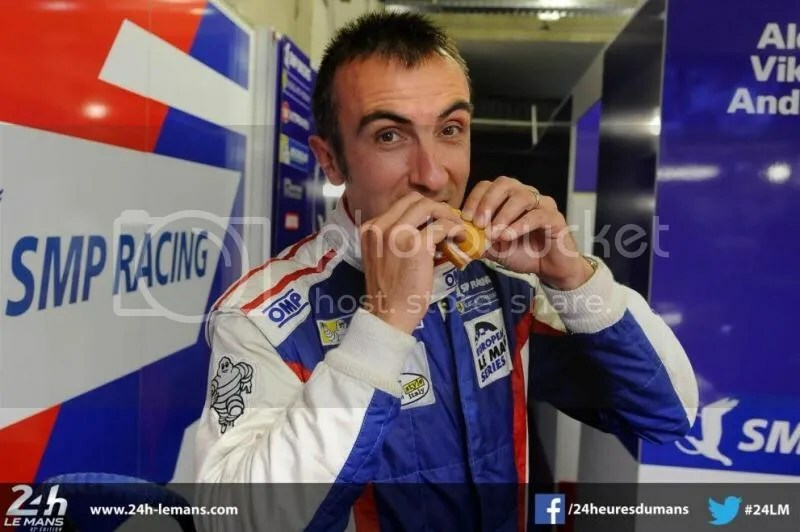 There’s also an exciting new partnership with a company that you should see in place in time for Donington, and I should fall under the banner of Glenn’s race team. This will lead to another car out on track before the end of the year, with a view to getting 4 cars out for the 2017 50 years of UK Vee celebrations! 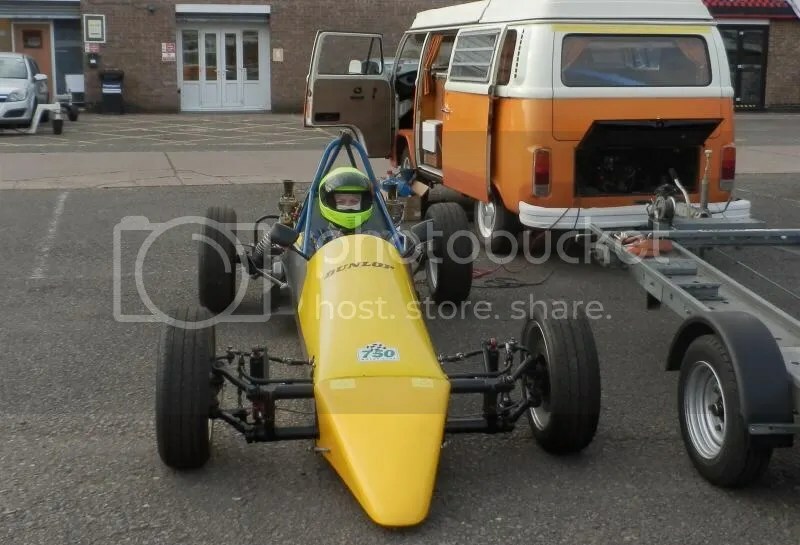 The cars out for 2017 should be the Scarab in which Ian Flux and Glenn Hay both won the UK championships, with the other car being the Beech in which Jenny Nadin won the first ever Formula Vee race in the UK. 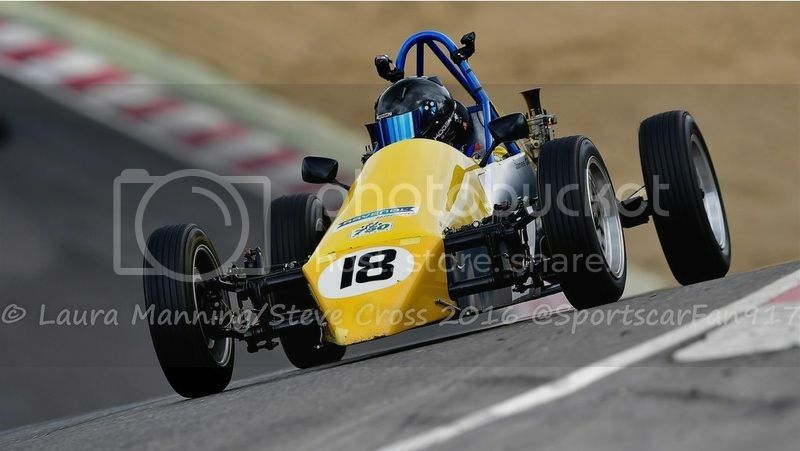 I’ll also be pushing more to raise my profile, looking for more sponsors (and trying some new things) and have already spoken to local newspapers to print some race reports, as well as a good few other ideas. Mentally, I’ll be getting my head back in the game to hit the ground ready to build on last years pace (although we won’t have time to test before qualifying), and getting some iRacing laps in to see how that helps. It’s hard to make much judgement from the entry list for this race, as I’m sure a lot of others are leaving things a bit late, but it seems most of the usual front-runners will be back to battle it out. Paul Smith may be concentrating more on racing his Crossle this year, but Martin Farmer will do a few rounds when his HRX business allows. 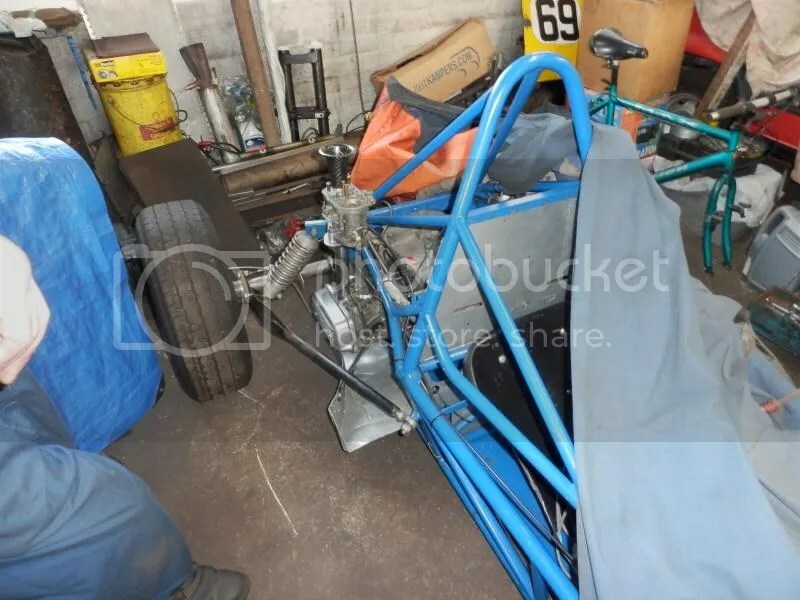 James Harridge will be going all out, but so will Adam Macauley over from the Irish Championship, with Ben Miloudi back out in a newly built car as well. Ian Jordon will be hoping to go one better this year, and I’ll be here all day listing the many drivers who are in with a realistic shout of winning the championship this year! There’s a Harry Webb listed in Class B for AHS who may be one of the new ones to watch, and I’m sure the usual battles will rage all the way down the grid. I’ll be aiming for the top 10 this year, and if I can get close to the top 3 in Class B whilst keeping things safely on my learning curve, I’ll be happy with that. Not as happy as if it all comes together and I get some wins myself, though! We’ll see… either way 2016 should be another great year!